Our former favorite Gottino, but something has changed there, they seem to be more focused on food and coffee than wine, some definite change of approach here, too bad. Our favorite now is Aria at 117 Perry Street. We first wrote about Gottino in 2008. Three years later, celebrated our 26th wedding anniversary here last night, had a beautiful time followed by a magical nighttime walk on the new section of The Highline. Gottino, on Greenwich near Perry Street in the West Village. A creation of one of our favorite chefs Jody Williams. 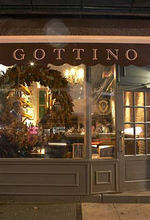 Check out the web site Gotttino When you visit tell Jeremy you saw Gottino here. We love dim sum, but have not found good dim sum outside of Chinatown in whatever city. We have enjoyed this sort of feast, in New York, Montreal, San Francisco and other cities. We came across Cheng Du 23 by chance and were ready for lunch. We were delighted when we sat down and were handed a dim sum menu. Now if you can rate an Asian restaurant by how many Asian people our dining there, Cheng Du 23 has got to rate an excellent. At around 1:30 it was pretty busy with famillies and friends who clearly knew the cuisine. We had no wine or beer at lunch but will be prepared the next time. This week at the Pepolino Ristorante in Tribeca I had the opportunity to meet some of the very wonderful people of the Consortium Morellino di Scansano as well as enjoy much delicious wine and Patrizio Siddu and Enzo Pezone's delicious Tuscan cuisine. Here is a Fabulous Site for the Best Things in Life - Wine, Chocolate, Flowers and Gifts for our UK Friends and our US Friends too. This fabulous site Serenata Wines "An Experience in Wines" offers delivery worldwide. They have the most wonderful selection of wines, chocolates, gift hampers, flowers and plants. I came across Serenata while looking for a way to send some flowers to a friend in Barnet, England and was totally delighted buy their offerings. A great place to visit for the gift giving season ahead. It will be a great weekend to get out for some outdoor activities. We are heading north for a hike around Lake Minnewaska and then to New Paultz to visit Gilded Otter Brewing Company. For the first time in a long long time Diana and I decided to take the entire weekend off. I planned a day of activities for Saturday that began with morning Yoga, a beautifully sunny trip to and wonderful hours at the magically beautiful Storm King Art Center. From there we planned to go to an Octoberfest celebration at the Bear Mountain Inn. But the park was closed by the NY State Police. I guess because to many people had crowded the park. We headed across the Hudson and down the East Coast of the Hudson in search of another destination. That's the Three Legged Buddha by Zhang Huan. The rest of our weekend took us to some great beer spots, the serenic beach at Sea Girt, to the movies, and more. When I received an invitation to a gathering of wine peeps on Charles Lane in New York City I was immediately intrigued. Despite living in New York City for over 19 years, 4 years just a few blocks from this precious little street in the West Village, I never knew it existed. Charles Lane is a one block stretch of ancient cobblestone between Washington and the Westside Highway and happens to be a perfect place, if you happen to have a friend who owns an apartment there, to drink some wine and share wine stories. You certainly know Italy as a country famous for its stylistic and indivdual expressions of fashion, product design, fabulous food and wine. Hey have you seen the new Fiat 500? In wine, Italy surpassed France a few years ago as the country that produces the most wine in the world. This is not necessarily a good thing as we kind of know that quantity rarely means quality. Not so in the case of Italian wine producers. You see Italy could probably also claim the title of world leader in variety of wine. There are hundreds of grape varietals produced there and over the last three decades Italian winemakers have focused deeply on quality. The result is a lot of fabulous unique wines from Italy. Unfortunately this presents a new problem. How does one share, market, all these wines? Unlike France where you can talk about Bordeaux or Burgundy and in one sweep and represent scores of wine-makers and their wines, with Italy it is a bigger challenge.